Desserts are my weakness and as much as I try to make them less often, that is one thing I can’t stay away from. When choosing my Blogging Marathon themes for July, my husband requested me to choose more savory themes and stay away from sweet. I was quite late to register for the month due to our travel and vacations and turned out that I did not have many options left to choose. When I saw the theme for Single serve desserts still open, it was too good for me to pass. 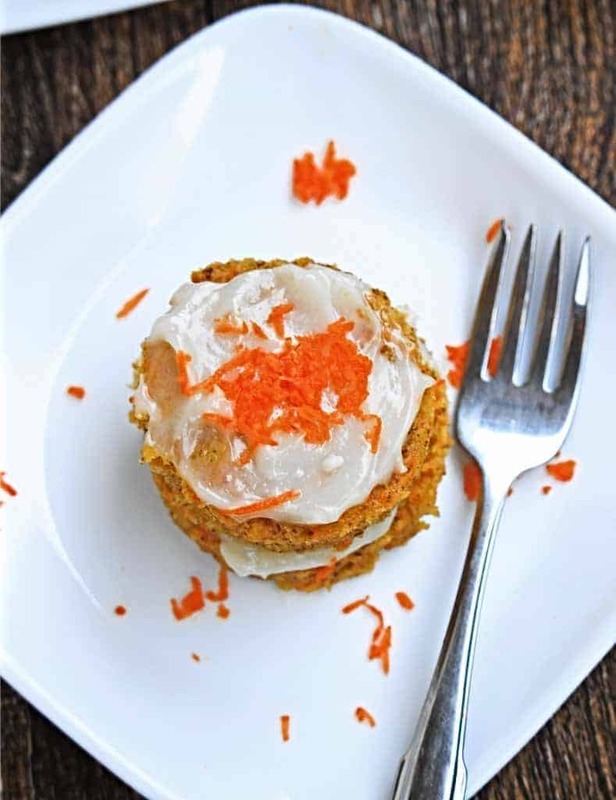 My first recipe under the Single serve dessert theme is this quick and easy to make Single Serve Microwave Carrot Cake. We all love carrot cake and I make it quite often as cupcakes for my boy’s school snack or when having company over. Loaded with juicy carrots, pineapples and crunchy nuts, it is a joy to bake it. 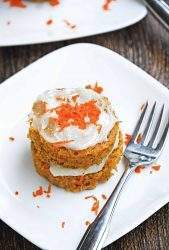 The best part about the carrot cake for me is, I have a jackpot recipe from my husband’s colleague and it is one of the best tasting carrot cake I have eaten. 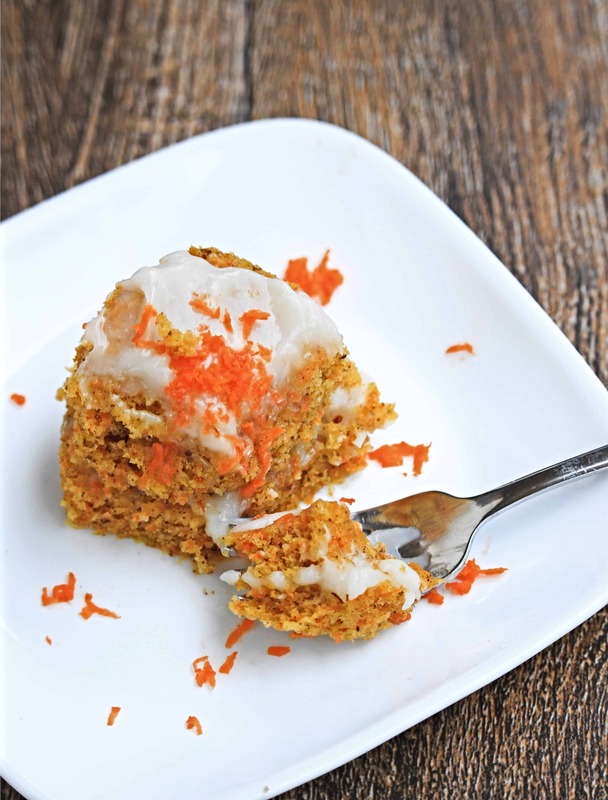 I stuck to the same line when making this quick and easy version of Single Serve Microwave Carrot Cake. I used almost the same spices and made few changes to make it work in the microwave. The end result for perfect spongy cake with beautiful crumbs and all it took was about a minute to bake. 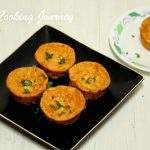 I used small clear ramekins to bake the Single Serve Microwave Carrot Cake. Initially I was planning to make it in a mug, but then thought what is carrot cake without frosting. Then there was a change of plan to bake the Single Serve Microwave Carrot Cake in small clear glass ramekins. This was the perfect size to slice in between and smear with some quick cream cheese frosting. The quantity I made was supposed to be for 2 mug cakes, but turned out that I was able to make 4 with the smaller bowls that I chose. So, we each had a piece of our own to enjoy. 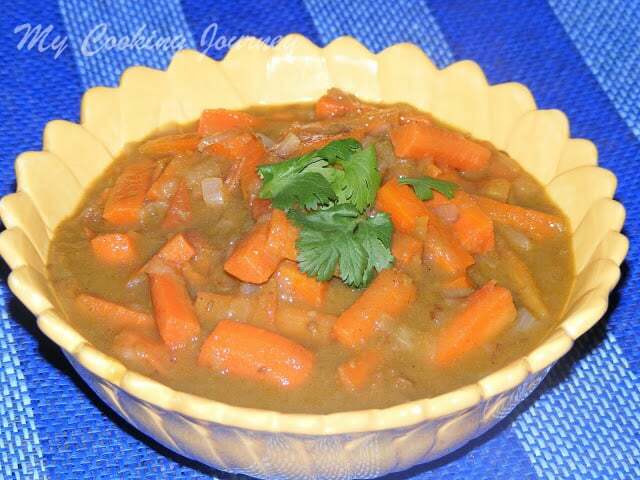 In a bowl, combine all the wet ingredients along with the grated carrots. Make sure that you grate the carrots really fine as we are going to use the microwave to bake them quickly. Large chunks of carrot might taste very raw. In another bowl, combine all the dry ingredients. 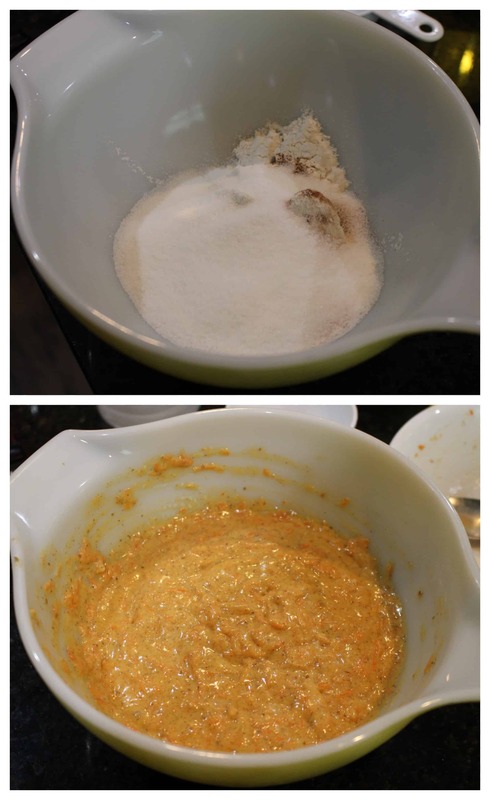 Mix them to combine using a wire whisk. Add the wet ingredients to the dry and mix gently to combine. Do not over mix as the cake will turn our hard. Grease a couple of ramekins well with butter. Add the prepared batter to the bowl. 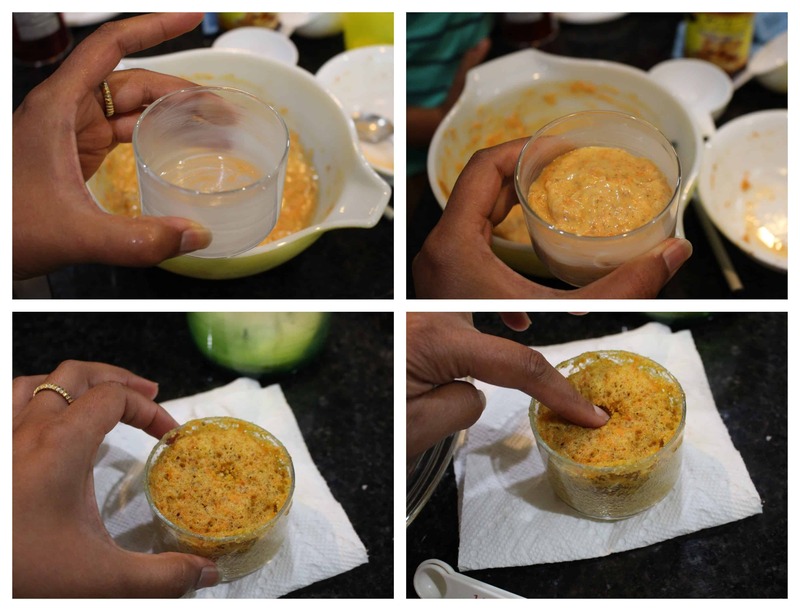 Make sure that you fill it less than half way through as it will rise during cooking in the microwave. My ramekins were quite small and it was scary to watch them when cooking as I was constantly worried that they would spill out. Microwave for a minute in 50% Power. The batter did rise quite a bit, so make sure that you are cooking it in low power. After a minute, cook it further for about 15 more seconds in full power to complete the baking. Remove the ramekins from the microwave and set it to cool. Remember that the bowls will be quite hot to handle. So remove it carefully. 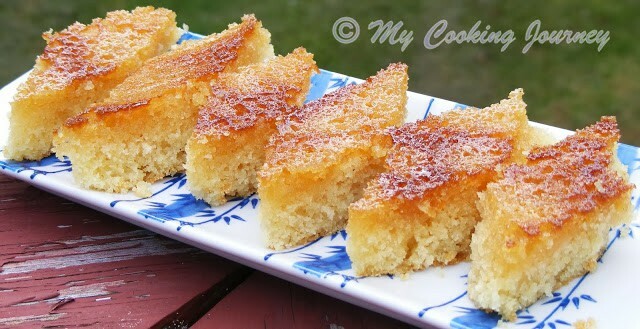 Once they cool down, run a knife along the edges of the bowl and remove the cake. Slice the cake in between and spread the cream cheese frosting in between the layers. Spread some frosting on the top as well and serve. Soften a cream cheese in the microwave and whisk it well. Add the vanilla and the butter and combine. Slowly add the powdered sugar and mix well to combine. The frosting is ready to use now. Beautifully baked. I love the color of the cake contrasting with the frosting and the carrot garnish. Excellent choice Sandhya. 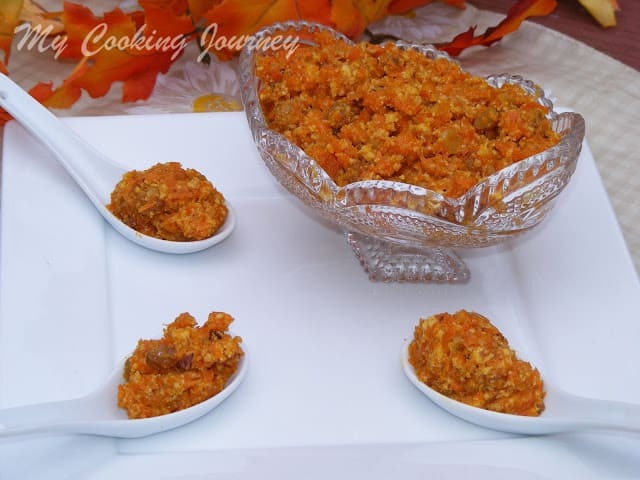 Making in one bowl and serve is such an easy and looks great to present as well!..love carrot cake with all its spice. Nice to know you could make it for a single serve as well. Carrot cake looks so sinful and moist.. love it. 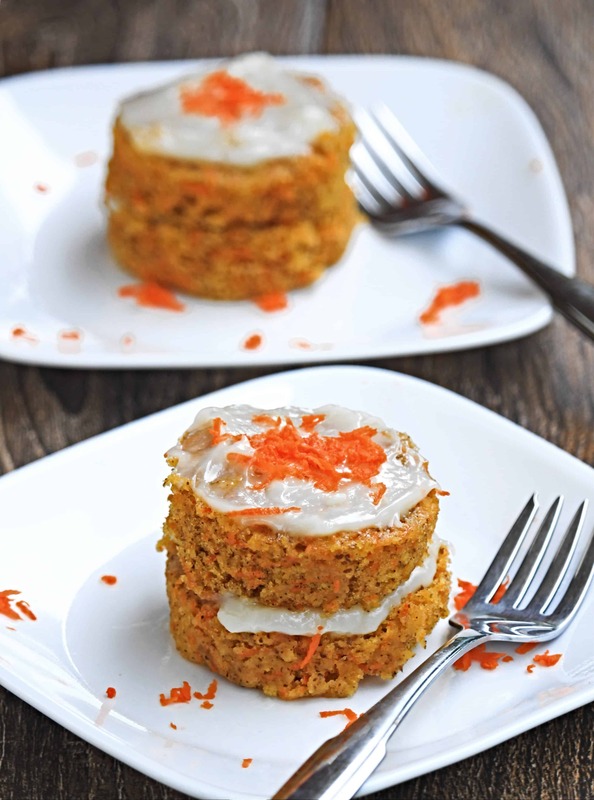 That is an awesome looking carrot cake Sandhya. It has turned out so good and with the cream cheese frosting, it must be so yum. Love this instant version which gets ready in one minute.. Such a pretty looking microwave carrot cake, easy to dish out to serve as a dessert after a heavy meal na. Lovely presentation. Such a pretty looking cake, Sandhya. I loved the use of sour cream. Single serve carrot cake looking so tempting and delicious. Love the way you have created it. Beautiful presentation. Omg how cute those single serve chocolate cake looks and the cream cheese frosting is to die for. 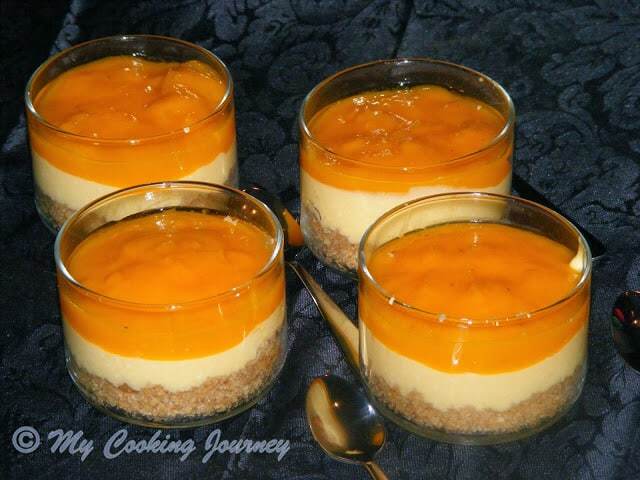 Wow, Single serving carrot cheese cake looks amazing, Sandhya. The cake looks soft and turned out perfect. Wonderful cake Sandhya. 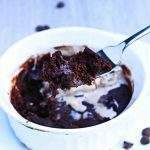 Normally, when I think of mug cake, only chocolate cake comes to mind. I’m teaching my oldest son a few more recipes this year before he heads off on his own. This will be a great one to teach him. you are seriously brilliant! I love carrot cake and no one else does! I cant wait to make this for myself its perfect! I love carrot cake and being able to make a single serve cake in a flash sounds right up my alley. Thanks for sharing! I know it may sound totally weird, but I am the ONLY person that likes carrot cake in my family. Can you believe it?? I never make it because I would have to eat the whole cake. Hmmmm…on the other hand that might be a good idea LOL. 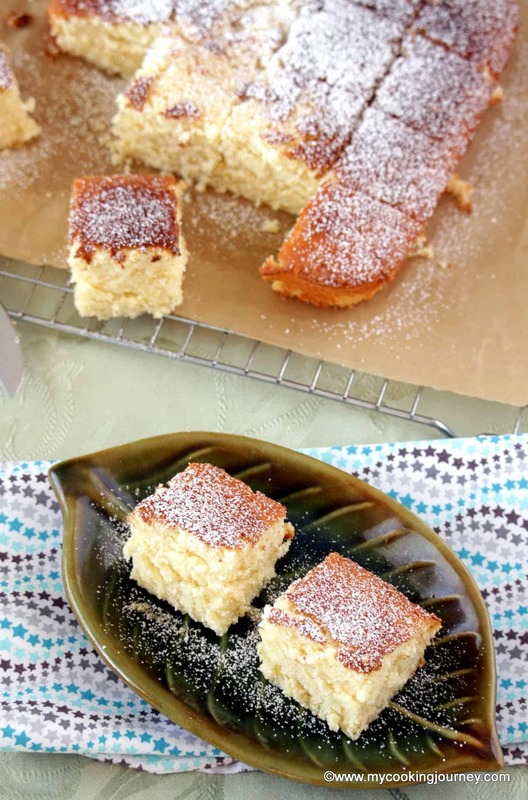 This is the perfect recipe for me….I can make cake FOR JUST ME!! This would be perfect for those times when you need a carrot cake and no time to make a whole cake or no one to eat the whole cake. Carrot cake is not the most popular with my kids. So often I’m the only one that craves carrot cake. Now I know where to look for when I need a single serve carrot cake. Saving this for later. 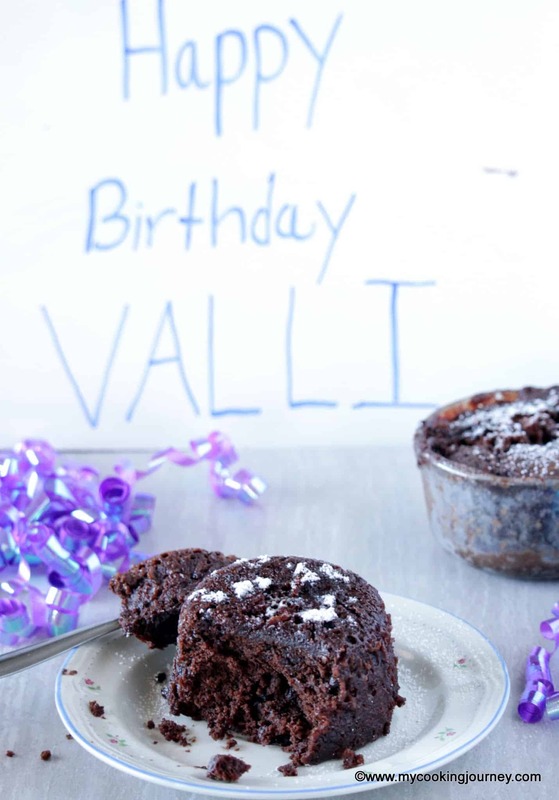 Single serving desserts … perfect when you have a craving, or when you’re baking for one or two people. This is a classic flavor combination! Thanks for sharing! These are so cute! 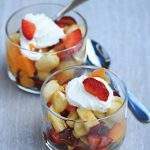 I love single serve desserts like this! I haven’t had carrot cake in forever, but need to try it again! What a great idea. Hubby here doesn’t want me making desserts unless we have some kind of gathering. We are watching our weight and having sweets around is a temptation. Now your single serve microwave carrot cake is a terrific idea. 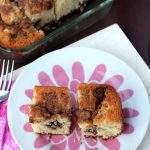 You can satisfy the sweet tooth and then not have any left over. Saving this recipe. This looks so tempting to me. Single serve carrot cake definitely makes it a lot more easier to control portions especially when trying to limit indulgence. 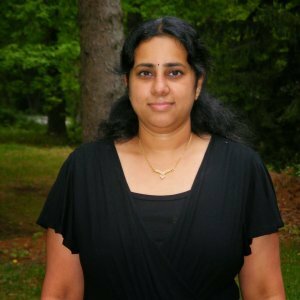 I agree Subhashini! Thank you.